PGIM Real Estate is suing two tenants at CityPlace Doral, alleging hundreds of thousands of dollars of unpaid rent, court documents show. Park Square 5 LLC is suing Sushi Siam and Flair Street for breach of lease and breach of guaranty. 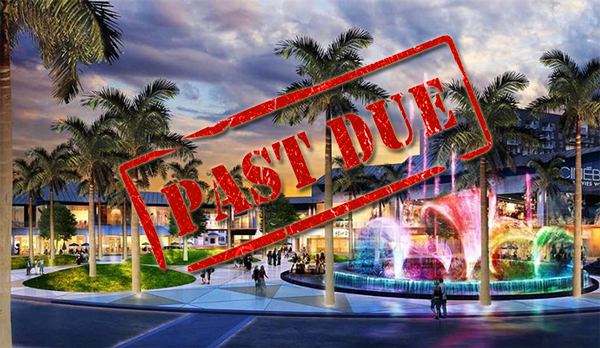 In two complaints filed earlier this month in Miami-Dade Circuit Court, the PGIM affiliate alleges that Sushi Siam Doral LLC and Flair Street’s YKC Doral LLC have not paid rent since CityPlace Doral opened nearly a year ago. The suit sheds light on commercial rents at the recently built outdoor mall. The Related Group, Shoma and PGIM opened the mixed-use development at 8300 Northwest 36th Street in mid March of last year. CityPlace Doral’s retail component has 40 tenants, including Brimstone Woodfire Grill, BurgerFi, a 550-seat CinéBistro, Cooper’s Hawk Winery & Restaurant and Sloan’s Ice Cream. The $800 million, 55-ace development also features more than 1,000 residential units. According to the lawsuits, restaurant Sushi Siam and Flair Street, a bar controlled Sushi Siam’s Yongyuth Nethongkome, have not paid any rent since the grand opening on March 17. The PGIM affiliate alleges that Sushi Siam owes nearly $311,000 in rent as of Jan. 31 and an additional $1,022 in per diem rent. Flair Street, which also has a location at CityPlace in West Palm Beach, allegedly owes about $278,000, plus an additional $915. For the first three years, Sushi Siam was set to pay about $262,000 per year. For years four through seven, the agreement calls for $288,000. And for the last two years of the 10-year agreement, the restaurant would owe $317,000, according to the suit. Flair Street signed a deal for $252,750 per year for the first five years and $278,000 for years six through 10, according to the complaint. It doesn’t appear either tenant has opened at the mall. A map on CityPlace Doral’s website shows Battosai Sushi Siam is slated to open soon and Flair Street is not included on a list of restaurants. An owner or representative for Sushi Siam could not immediately be reached for comment. PGIM declined to comment, and a spokesperson for CityPlace was looking into the suits. In August, Related, Shoma and PGIM sold the Manor at CityPlace, an apartment complex, for $135 million.